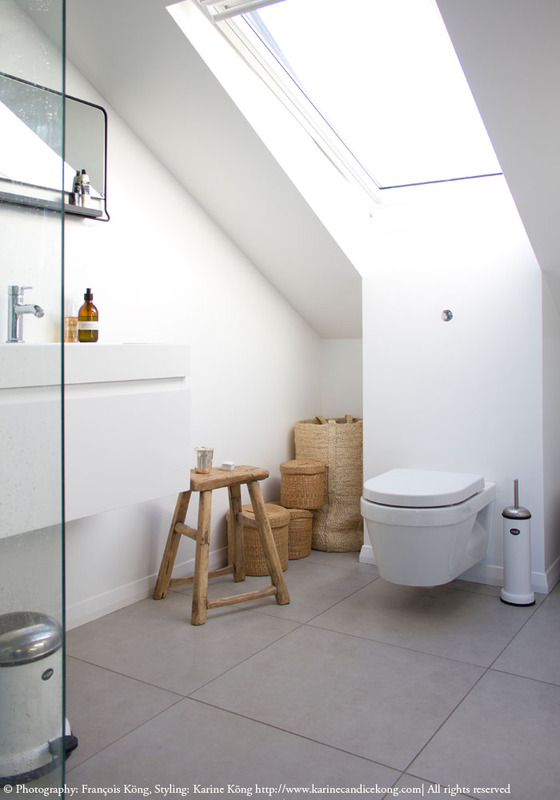 When we started our major renovations in our London home, the first big project we tackled was the loft conversion to create a double-bedroom with en-suite bathroom. Once this new room was finished, we pretty much moved in and camped there for about 7 months while the builders were working their way down through the second floor to create a new room where the terrace was, then the first floor where we raised the floorboards and finally to the ground floor where we replaced the tiles and floorboards by a resin floor and fitted a new kitchen. You can see more photos on Instagram under #bodieandfourenovations. The whole loft conversion project took about 7 weeks which is actually pretty quick and was partly due to the team working quickly and us being able to get the material they needed on time (floorboards, bathroom fitting, tiles, heating). The end result turned out even better than what we had in mind. I remember coming back from our pop-up store with Vipp in Copenhagen to a house with no roof (very impressive!). 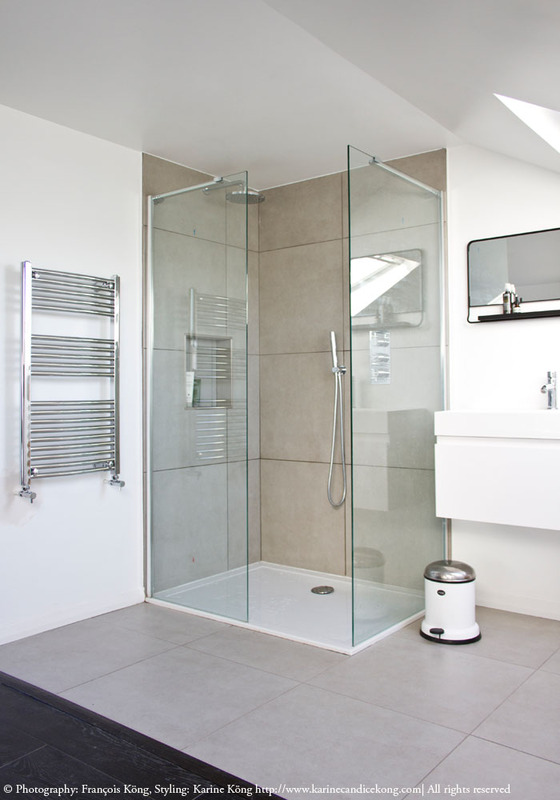 I purposely didn’t want a wall separating the bathroom from the bedroom to keep a sense of space and benefit from the sky window fitted in the bathroom area. Now the privacy issue may not work for everyone but considering the number of times people use the toilet upstairs (we have now 3 in the house) Vs the benefit of having a room filled with natural light, I do not regret my decision. However, we added a small wall so when someone is lying in bed, there is still some privacy. The recessed corners on each side of the toilet can be used for storage or fitted with shelves. Storage: This room has plenty of hidden storage. There is a large wardrobe on the left-hand-side of the bathroom, the vanity unit is fitted with a large pull-on drawer and there is plenty of storage space behind the wall (photo below) under the attic. Bathroom design: I wanted a practical, contemporary bathroom with a large shower tray and fell in love with these large grey tiles from Castelnau Tiles. They have shops in Barnes and Kingston and can send samples & stock from one place to another same day/24 hour. I strongly recommend you check their site, they have amazing tiles and really great customer service. They let me borrow a four tile sample so I could see what they would like in our space, which was very useful and it allowed us to see how they looked and felt once wet. Some were very slippery but the ones we chose aren’t and they have a nice finish. As I wanted to splash on our master bathroom, I chose a selection of modern fittings from the high-street for the loft conversion. The large shower head (Fast Flow) and the large 1200 x 900 Slimstone shower tray work wonder. To give it a designer look, we added a Metro 2000 valve back plate & control, which is actually very practical to clean the shower. 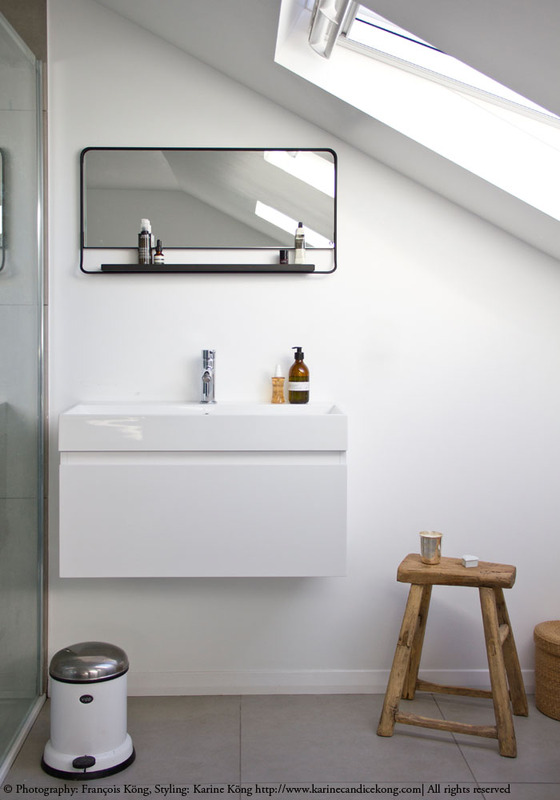 The Mino 800 vanity unit provides plenty of storage and works very well with this mirror. The only thing to bear in mind is that this unit is made of resin not ceramic therefore you can not use staining products like hair colour but it was the only one that had a very simple yet contemporary design with clean lines. I also recommend you check what your neighbours have done with their conversion first. Once we saw the loft conversion of our neighbours done in the 80s, we were shocked how small it was and definitively not worth spending £30K. To get the benefit from the conversion, we realised that we had to maximise the space as much as we could. So we pushed the walls as far back as we could and fitted the toilet where the roof slopes (although you can still stand up) but what saved us a lot of space was where Steve got the stairs fitted. Instead of coming back around into the room and lose all the space above the stairs, the stairs are running up and along the wall (how this is not standard we shall never know) and the vacuum of space above the stairs has been used to fit the wardrobe. Architect & planning: We initially hired an Architect but then decided to go alone before the project started for the simple reason that it can be expensive, slow down the process, and an architect is not looking to live in your space, so their motivations can be somewhat different. Also, you need to decide between having drawings and onsite management from an architect, and that will be a very personal decision as well as a budget issue. Make sure they are clear about their pricing – the market standard is 11% of total build cost. A flawed model if there ever was one… We decided to work closely with the builders to achieve our vision and in the end, this room turned to be 15 sqm2 and has become one of the largest bedrooms in the house with an amazing view on London (evening light here). For this kind of project, planning permission is required (check with your local council), party wall agreements are required and you should make sure this is in your cost budget (circa £1,100 per neighbour) and time budget (12 – 14 weeks). Loft King sourced and fitted all the windows including the large glass panel, insulated the room and fitted the black floorboards, the bathroom. They basically took care of the project from start to finish which was fantastic and stress-free considering (stress came in later). Loft conversion company: Loft King (which we highly recommend!). Steve being a kiwi, he was keen to work with Kiwi builders and found George’s company on the net. They have been nothing but helpful and have done an amazing job, as well as being substantially cheaper and quicker than other quotes we got through the Architect (who gets paid 11% of all building works….). As they moved on creating the new office afterwards, they saw me in my PJs a few times over the past few months but it’s one team we would defo work again with, should we tackle another insane project. Superbe! Et plein d’excellentes idées – merci! What a great post. We are about to start our loft conversion and this is so useful thanks! What a beautiful room! I adore the mirror!! Such a beautiful room – I love the contrast between the contemporary fittings and the antique stool. Amazing bathroom!! We live in London and would love to renovate our flat as well. Would love to know the details of your contractor!!! Thanks in advance! Pingback: ROOMER | Bodie and Fou – ראיון יומולדת חגיגי עם האישה והסטייל. Previous Post5 things I want right now!